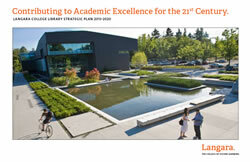 Langara Library is at the heart of a vibrant, engaging and exciting educational experience, and an essential contributor to academic excellence – a progressive academic library, fully integrated with the teaching, learning and research at Langara College. We are a vital partner in academic excellence and student success – a hub for the intellectual, cultural, and social life of the Langara community. The implementation of this strategic plan will transform the Library from a separate support service to an integral part of the College. The Library is your link to worldwide information resources including books, journals, magazines, newspapers, databases and media materials. Our collection supports the research needs of Langara College students and the college community in general. The building provides individual, silent, and group study options, as well as computers, wireless access, computer labs and printing facilities. Help with research is available in person, or by text messaging, chat, email or phone. Langara's Learning Commons is on the first floor of the Library, featuring an expanded and enhanced work and study space, technology-enhanced tables to enable sharing of content on mobile devices such as laptops, a flexible tutoring space (Writing Centre and subject peer tutoring), and a streamlined library service point. The LEED Canada Gold Certified Library/Classroom Building features a unique energy-efficient design. It has captured national and international attention for its environmentally progressive features and is a landmark on campus and in the community. For more information on the Library building's environmental design, green features, and numerous awards see About the Building. blog for all Langara faculty and staff, featuring collection highlights, copyright updates, issues in higher education, and behind-the-scenes information about Langara Library. August 2012 interview with Patricia Cia, Head of Library Services, and Annie Jensen, Communications Librarian, discussing the development of the Library's Learning Commons (then under active construction), as well as the changes facing academic libraries like that of Langara.